In 2013, a group of nearly 100 Chinese immigrant workers in San Francisco mounted an ambitious organizing campaign targeting their employer, the award-winning, high-end dim sum restaurant Yank Sing. 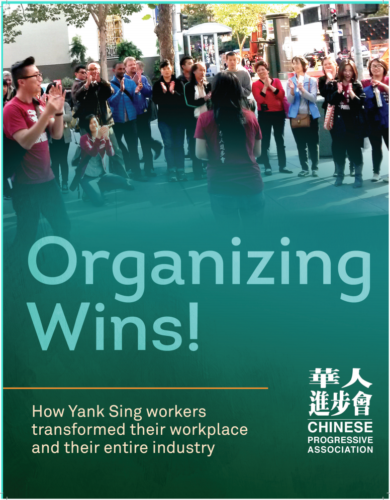 The workers, who were cooks, dishwashers, and wait staff at Yank Sing, had approached the Chinese Progressive Association of San Francisco (CPA) in the spring of that year, detailing numerous workers’ rights violations. More than a year later, with the support of CPA as well as key labor and community partners, the workers won a landmark settlement that included an unprecedented $4.2 million in back wages. The settlement also included several groundbreaking improvements that transformed their workplace and raised standards across the board for their industry. This victory was made possible by the courageous efforts of the Yank Sing workers, who built their power over months of sustained organizing, as well as by CPA’s decade of work developing worker leaders, organizing campaigns, and building strategic partnerships and relationships with labor unions, small businesses, service providers, legal advocates, and labor agencies. These efforts led Yank Sing owners to change their practices and agree to adopt unprecedented industry workplace changes not required by law to become a model employer. This is the story of how organizing won.